Gummy bear implants have been used for ten years in Europe, but the data from the US clinical trials has not matured to the point that we can argue any of these advantages conclusively. These are the expected advantages and disadvantages of gummy bear breast implants. It does seem that these implants do maintain their shape, thereby making them able to impart their shape upon the breast. Non-form stable fillers, such as saline or standard silicone gel, are subject to the forces of gravity and of the breast, so that they assume the shape that the forces of the breast and the forces of gravity dictate. 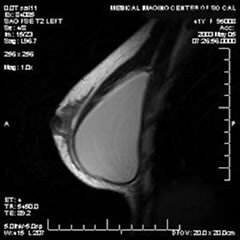 These implants have a distinct shape, and they will impart it upon the visible shape of the breast. Since the fill does not shift from one area of the shell to the other, shell collapse and folds do not seem to occur, even in long term follow up. Cohesive (left) vs. standard gel - note how the cohesive does not collapse or fold. There are two components to this issue. One is whether the shell might break, and the other is whether the gel will leak out if the shell does break. The shell is certainly physically susceptible to breakage, but since most ruptures are believed to occur along shell folds (they result in weakening of the shell, much like a folded newspaper left in a drawer will crack along its folds), it is expected that shell failures will occur less frequently. In the largest series in the world, there has supposedly been only one shell failure in several thousand implants done in Sweden. If the shell is peeled off the implant, the cohesive gel filler will maintain its shape. I have one that I did this to several years ago, and it looks just the same as the day I did it. But, that doesn't mean that in the warmth of the body, and with the forces that act upon the implant, that the situation wouldn't be different. Another issue is diffusion; though there is a layer of the implant shell that decreases silicone diffusion, some microscopic diffusion of silicone will always occur through the shell. MRI of a cohesive implant shows anatomic shape, free from folds that are not just visible and palpable, but worse, can be the site of shell failure. The European experience has been that firm scar tissue seems to occur less often with these implants (capsular contracture). It is not clear if this will be maintained over time, or what the cause is. Some speculate that it is related to there being less diffusion of silicone than with non-cohesive fillers, while others believe it is due to the increased firmness of the implant, which inhibits the body from contracting around it. More time and study will be necessary before we know the answer to this issue. It is listed here for the same reason that it is listed as an advantage. Since it will impart its shape upon the breast, the patient and surgeon had better be sure that they are choosing an implant shape that they want the breast to have. While implant selection certainly matters with old style silicone gel and saline implants, since their shape so so affected by gravity and forces of the breast, there is a great margin for error. This is not a problem per se, but rather, this is an issue in which one must be aware of. For instance, women preferring "Baywatch"-grapefruit looking breasts may find the teardrop shape of this implant will not meet their expectations. I think this problem becomes significant only in "disproportionate" augmentations, situations in which the implant size chosen exceeds what is optimum for a patient's soft tissues. These implants do feel a little bit firmer than old style silicone gel implants (though if the old ones get a capsular contracture, they will feel firmer. Some believe that the cohesives are less likely to get such a contracture, but that is not yet known.) How significant this is in a given patient depends upon how much breast tissue they have relative to how large an implant will be chosen, and how firm or loose their tissue feels. A rare patient will complain about the firmness, but for most patients, particularly those getting implants that are not oversized, this is not an issue. These implants do cost significantly more than saline, and several hundred dollars more per pair than old style silicone gel implants. However, if part of the study, patients will be reimbursed most of the implant cost over a period of ten years. Since these implants are not deformable, they cannot be squeezed through little incisions. Depending upon the size of the implant, incision length must be between 4.5-5.5 cm. It also can make insertion from around the areola difficult (I usually use the underneath incision with the cohesive implants.) Armpit incision is possible, but exceedingly difficult. These implants only come in anatomical shapes, meaning that they project more on the bottom than they do on the top. One of the risks of such a design is that if the implant rotates in the body, it will create a distortion. Care is taken during pocket dissection and insertion in order to minimize this. It is a very rare, but very possible complication. The only way to fix it if it occurs is to remove them and replace them with a round implant. Rotation is at greater risk when the tissue is loose, for instance in a revision when a patient wants to go smaller. Since the gel is almost a solid, it can actually crack. I have only seen this happen from excessive manipulation of the implant outside of the body, but it can theoretically occur in the body. No one knows if this can actually occur, or what the consequences would be if it were to occur. My speculation is that it would not be noticed, but the answer to this is not yet known. Information & photos courtesy of Dr. Teitelbaum of Santa Monica, CA. For more information on gummy bear implants, see our articles on the History of Cohesive Silicone Gel Breast Implants and Cohesive Implants.